Infinity is here and like the last Marvel event Age of Ultron making its claim on a future MCU movie! Okay that may just be sarcasm creeping in. Infinity is a big story bringing together Earth bound and cosmic elements of the Marvel Universe. And with the inclusion of Thanos and the Builders combines both old and new elements of the Marvel Universe mythos. Worlds are being exterminated and restarted by the Builders, the “children” of the Universe who have been given the task of designing worlds and species. They seem particularly focuses on destroying worlds which have heroes, which should be of concern for Earth a world full of heroes. Meanwhile, Thanos sends out his Outrider assassin to uncover a secret, a secret that appears to be found in the mind of the Inhuman leader Black Bolt. With this secret in hand, Thanos sets his eyes on conquering a source of his constant defeats, Earth. The Avengers observe that the Builders and their armada are racing towards Earth. Captain America leads a team to confront the Builders before they can bring the battle to Earth. Meanwhile, Iron Man stays on Earth to prepare Earth’s defenses. With both known and unknown enemies, the Avengers and the heroes of Earth are called upon once again to protect their world. Who is the villain? 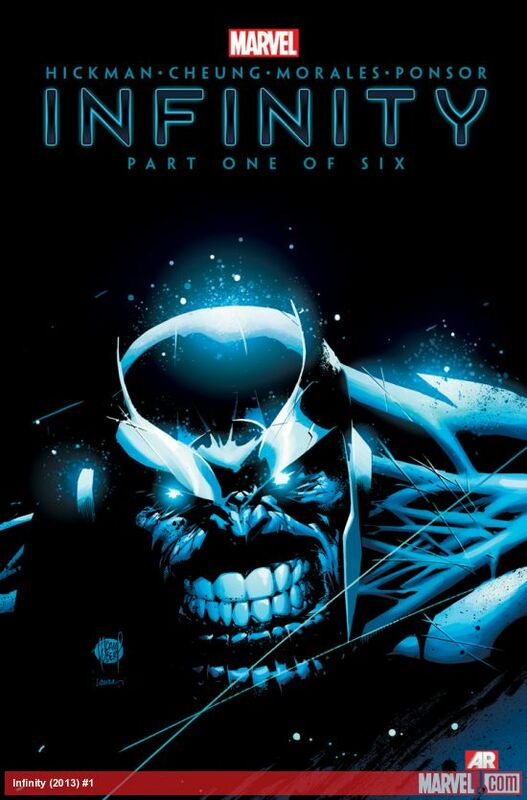 I am reading Infinity because of Thanos, who surely will be the villain for the fifth Avengers movie, or maybe the eighth if they play their cards right! And Thanos is there front and center, like right on the cover. But at the moment I feel like the Builders, to me a relatively new force, is the true villain. Being a force of the Universe, I wonder now if Thanos may become somewhat aligned with the angels since I assume the Builders and Thanos will have different agenda. I guess in the Builders’ eyes they serve life by exterminating worlds and restarting their ecosystems. While Thanos is a loyal servant of Death. This could be a battle between life and Death, where the grey may have us temporally cheering for Thanos. The cast of Infinity is huge. I admit it, I had trouble with the rosters and determining who should go where and if they should be included. It is going to a lot for author Jonathan Hickman to manage. And I wonder if the cast will only get bigger as the Avengers plunge into deep space. Surely they have to bump into Star Lord and the Guardians or the Nova Corps as this story progresses (okay we all know this will happen). I do not know if I see this story as epic yet, but it is big! S.H.I.E.L.D. is not featured in issue #1, though some current agents like Barton and Banner are active participants. Instead readers interact with Abigail Brand and the Sentient World Observation and Response Department or S.W.O.R.D.. I believe Agent Ward would say someone really wanted their name to spell sword. S.W.O.R.D. is the cosmic equivalent of S.H.I.E.L.D. with Brand as director. And it is very appropriate for S.W.O.R.D. to be front and center with the threats to our world coming from space. Marvel Cinematic Universe fans should be excited to know that the creator of S.W.O.R.D. was Joss Whedon, the writer and director of Avengers and Avengers: Age of Ultron. This is a big crossover event. Though its timing to me does not seem like a summer event! At the moment I plan to read the six issues of Infinity but I am not feeling motivated to read the linked in stories in titles like Avengers and New Avengers that I am not reading at this time. I will read the planned Secret Avengers tie-ins, but I do not feel like that I need to read all the supporting titles yet. I do hope that there is a giant collected edition, like Marvel produced for A vs X, where I can read the whole story in one bound copy. But at the moment I do not feel like I need to do any more than read the mini-series title. I wonder if that will change as the story moves forward. Infinity has promise. But as I stated, I am not collecting all of the tie-in issues yet. I often find it difficult to evaluate a story arc on a first issue since many of the limited number of pages are needed to set up the tale. But author Jonathan Hickman has earned me picking up issue #2 with this big story.